This dish sort of brings me round full circle. When I was growing up my mum cooked everything at home. Nothing pre-processed passed my lips unless it was school dinners or when being fed by somebody that wasn’t my ma. She even baked the bread, biscuits or scones that we’d eat. Unfortunately, when I became an adult and left home at 18 I turned my back on all this and embraced preservatives, e-numbers, trans-fats and high-fructose corn syrups and lived off cook-in sauces and frozen food. Cooking was browning mince or chicken breasts and pouring over some mother’s pride or sharwood’s sauce. What a rebel! Arriving in Istanbul to live as a twentysomething came as a bit of a shock when it came to cooking...instead of jars and packets of chemically produced gloop, the supermarkets were just full of vegetables, meat, fish, vegetables and spices. What are you supposed to do with them? While Turkish food is amazing, it was my first time outside the British Isles for any length of time and I began to miss British/Irish food. So, I had to learn how to cook them as 99.9% of the restaurants in Istanbul at the time served the Osman Mutfak (the Ottoman Kitchen) only. Fast forward 17 years and you’ll hear me whinging that despite Madrid being a major European capital, there’s only one Turkish restaurant…and that’s on the outskirts of the city (well, up near the santiago bernabeu…but as far as I’m concerned Madrid ends at Gregorio Marañón.) There was a great one on Cava Alta years ago, but that closed down to be replaced by a Spanish place. Then there was an amazing one on Santa Engracia which only lasted a year before becoming a Spanish place…because we were in desperate need of another Spanish restaurant. It suddenly occurred to me that if I missed my favourite Turkish dishes then I should cook them myself. Suddenly meaning “after about 5 years.” Yes, I can be a bit thick. So, here it is…Beyti! Lamb mince is extremely difficult to come by in Spain and Portugal, so I used beef mince. Into the mince add as much crushed garlic as you like and then add a little more. Throw in some ground coriander and cumin, salt and pepper and maybe some chili powder or piri-piri if you like. I think I might have put some chopped fresh parsley in there too. 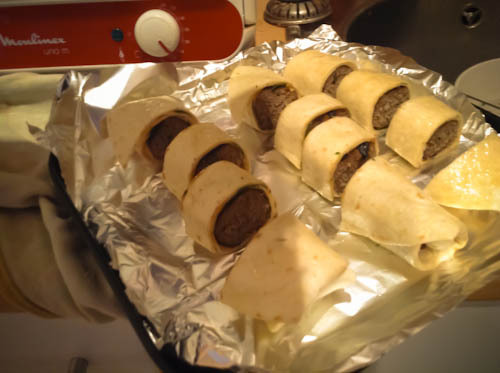 Mix the mince together and then roll into balls the size of plums (ahem)…put a metal skewer (or a wet wooden one) through the middle of the ball and then massage it so it looks like a fat cigar along the skewer. 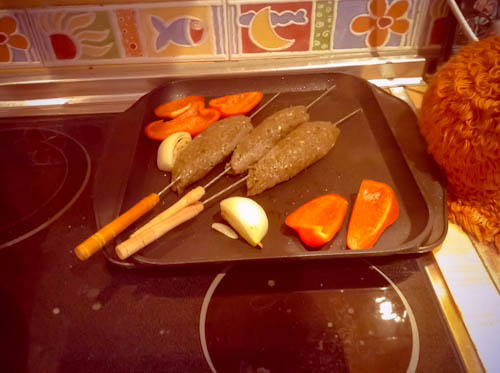 Then grill or barbecue or fry…I did it on the plancha. Put some lightly oiled peppers and onions on there too, you can add them to the dish when you serve it. 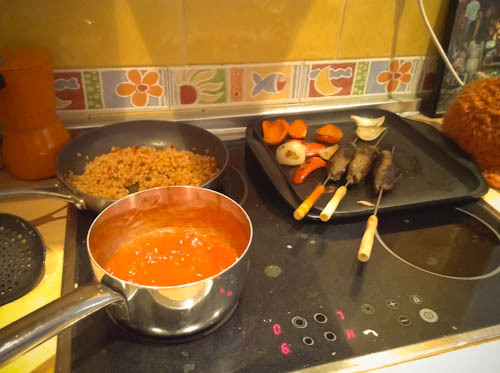 While they are cooking you can make the bulgur wheat and the spicy tomato sauce. If you’re not used to cooking bulgur, it’s much like coucous in that it soaks up the liquid you add to it. I had softened some of the onion and red pepper then added the bulgur and then some hot stock and cooked it down. The sauce was just a tin of tomatoes mixed with some harissa and probably a splash of white wine (it’s practically impossible to cook without using some form of alcohol. unless you’re cooking breakfast). You could use rice if you prefer, but I much prefer bulgur wheat…if it’s not readily available in your local shops you could try one of these health-food shops they have nowadays. Now, get a thin tortilla or dürüm..lightly brush it with olive oil on both sides and roll it around your kebab. 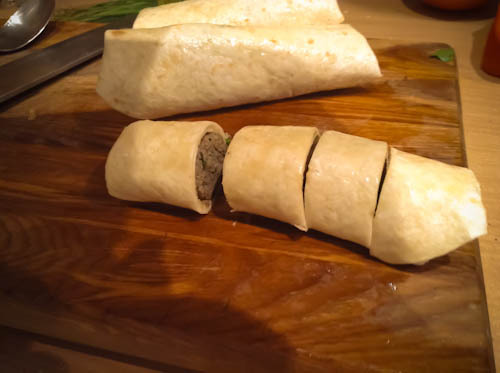 Then, using a sharp knife cut them into sections. 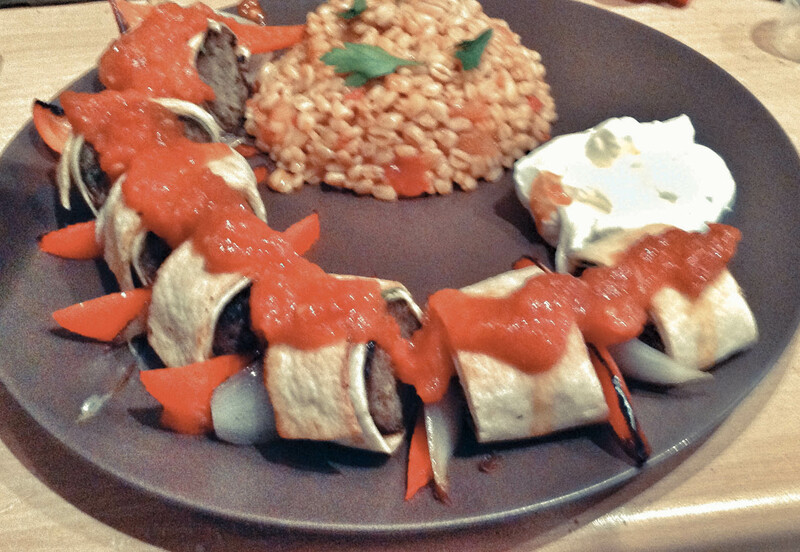 This entry was posted in eating in and tagged meat, Turkish. Bookmark the permalink.